Last week on my trip to the Midwest I had an opportunity to visit the Chicago Botanic Garden. The size of the garden takes your breath away. In addition, the many separate areas of plants in the garden amid extensive water views and fields tell you that this is one grand garden. My intention was to visit the English walled garden, designed 20 years ago by English landscape designer John Brookes. The day started with clouds and what seemed to me a threat of rain, but no rain came. I was happy for that. Brookes designed this English garden as six separate garden rooms. In that way the visitor experiences different expressions of the English garden. From what I saw that idea works. Though Brookes defines English garden here by more modern gardening in England, I found the experience a delight. The six rooms were fun to enter. Each created a different feel with the use of pathways, vertical supports, pergolas, garden furniture and accessories, statuary, and, of course, plants. The two gardens that stand out now that I am back home are the daisy garden and the courtyard garden. The daisy garden is one among the six that make up the English walled garden at the Chicago Botanic Garden. 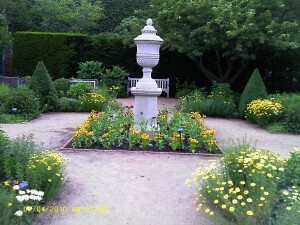 The daisy garden featured a vase on a pedestal as the center, surrounded by beds of daisies, both annual and perennial. The colors, of course mostly white and yellow, brightened the area. The lively annual rudbeckia hirta ‘Tiger Eve Gold’ caught my attention. 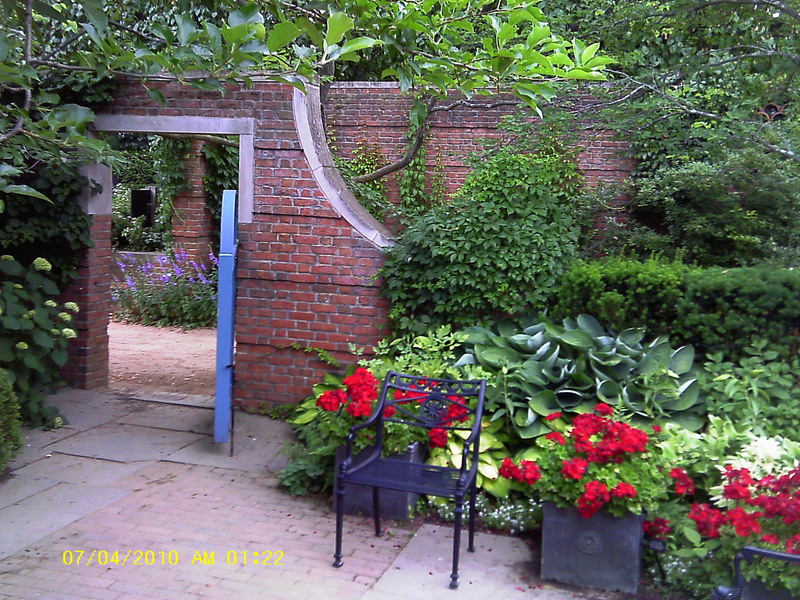 The courtyard garden included an archway opening, a bench, and show-stop red geraniums in containers. All of it encouraged the visitor to walk through and enjoy. The Chicago Botanic Garden's walled English garden includes this courtyard garden. Brookes surrounds the garden with a wall, mostly made of red brick with occasional clay tubes used in certain areas. Though the plants have changed over the years since the garden was first installed, the bones of the English walled garden remain. The garden rooms make for a restful setting for any visitor. When you visit this garden, you learn about the use of walls in English gardening, begun with Catholic monks who cultivated herbs within their monastery walls, before Henry VIII confiscated their properties in the sixteenth century. The walls provided protection from unwanted animals, and, of course, from the winds. I can’t end without a thank you to the generous staff at the Chicago Botanic Garden. Here in the US you can see an example of the English garden right in Chicago.